Make the filling: Sear the chicken breasts on both sides in some oil and remove from pan. Saute onion until it starts to brown. Add garlic and taco seasonings (I used cumin, coriander, oregano, and smoked paprika, but feel free to use a store bought mix). Cook 1 minute. Add chipotle sauce and water and mix to combine everything. 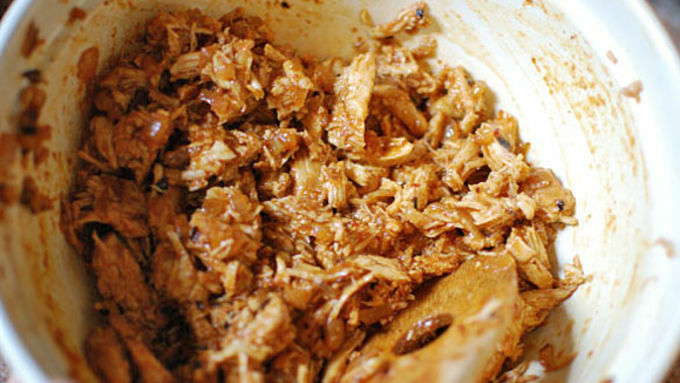 Add the chicken and allow sauce to simmer for about 25 minutes until chicken is cooked through. Remove chicken and chop/shred into small pieces. Return the chicken to the sauce and mix well. 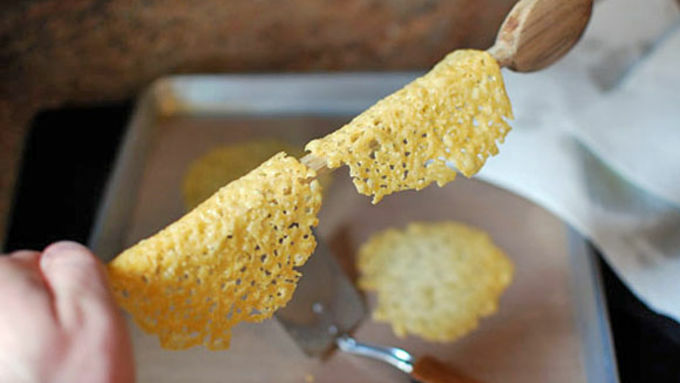 Make the shells: Shred the cheese. 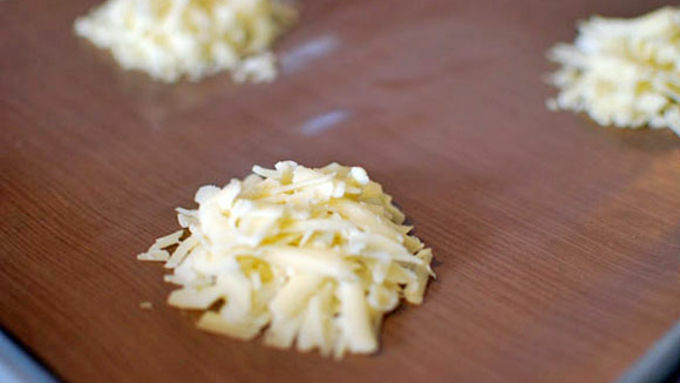 On a nonstick silicone baking mat, place a very loosely packed 1/4 cup of shredded cheese. Put as many as you can on the pan without crowding. I was able to fit four on mine. Bake at 350°F until bubbly, oily, and starting to brown. Remove from oven and sop up excess oil with a paper towel. Before it becomes too hard, lift the cheese round with a spatula and form into a shell shape by draping over a pole or other object until cool. Build your tacos, starting with some of the chicken, followed by sour cream, guacamole, shredded lettuce, or any of your favorite taco ingredients! 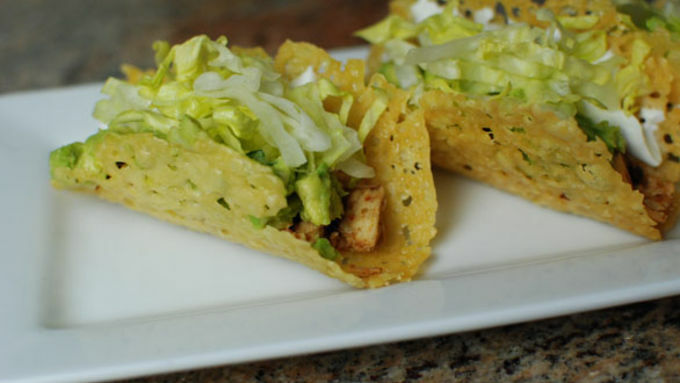 These chicken tacos are delicious but they have one special surprise; the shell is made of cheese! 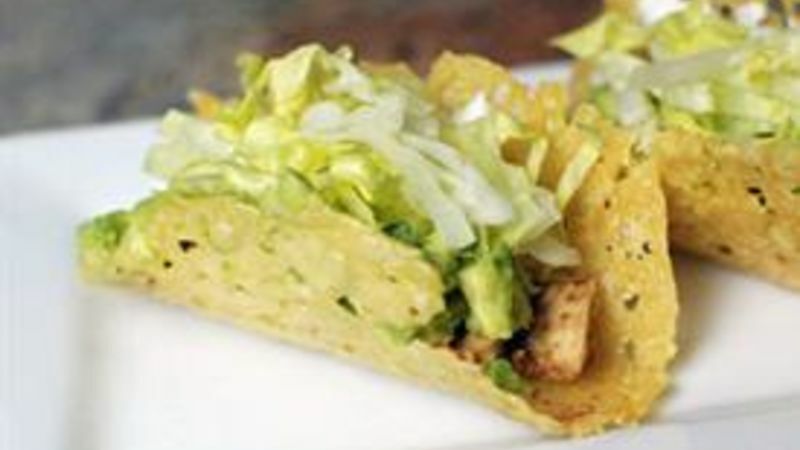 That’s all you really need to know about these delicious Chicken Cheese Shell Tacos. I’ll say it again. The shell is made of cheese. It’s crispy, salty, CHEESY, and a perfect match for this smoky chicken. Cooling ingredients like sour cream, guacamole, and lettuce finish off a unique and delicious take on a Tex Mex classic. I don’t know the science behind it, but for some reason an aged cheese works better for this. They come out of the oven as a perfect congealed round of cheese. These make for great soup or salad toppers, but of course we have other plans. I like to blot them with a paper towel first to soak up some of the excess oil after baking, then shape them into anything I want. We obviously are going for shells today, but you could make these into cups, leave them flat as crackers, or if you are feeling ambitious, make some crazy origami cheesebird. These are such a fun appetizer, and it’s great to watch your friends try and figure out what the shell is made of. On first bite however, there is no mistake. If you are a fan of burnt cheese like me, you will love these tacos!